Everyone loves a biscuit but they’re perhaps most comforting within the office environment, for they can fend off elevenses-hunger pangs and afternoon energy slumps, and make a great treat alongside a revitalising cup of tea or coffee. 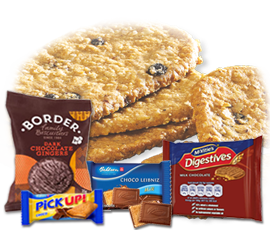 Here you can stock up on retail and portion control biscuit packs, as well as resealable stay-fresh assortment tubs and tins: perfect when you've an array of tastes to satisfy. 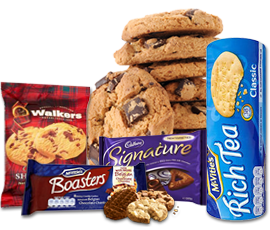 We have more than 60 varieties of biscuits from the nation’s favourite brands including Fox’s, Cadbury, McVitie's, Family Circle, Crawford’s and Jacob’s. 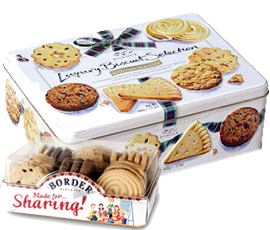 Whether you’re seeking classic biscuits like digestives and bourbons, or you’re seeking something a little more special to impress clients or guests (try Borders’ deluxe range) we've got your business’s biscuit needs covered. 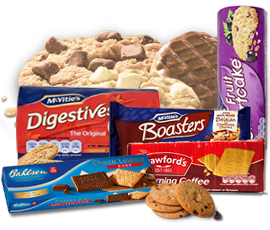 When you bulk buy biscuits, you get the advantage of our competitive wholesale prices on your order. Based in London? Get your biscuits delivered tomorrow when you order before 5pm. Elsewhere in the UK? Place your order before 2pm to qualify for our next day delivery service.